The essay was an old one. I had some written pieces before that I kept somewhere. I looked for them and chose one that I could bring to the workshop. I improved it – I provided details where they were needed. Again, I studied how essays are written. I could no longer allow myself to write aimlessly. I had to do it well. I did some trimming here and there. I made sure that I used transitional devices so that my narrative would be smooth and easy to read. Since I was writing a creative nonfiction, I tried my best to be faithful to the actual events as they happened. I used as inspirations for my poem the experiences and the things I had witnessed while I was growing up in San Roque, Northern Samar, my hometown. I let my friends who are also into writing read my poem. They told me what it lacked. 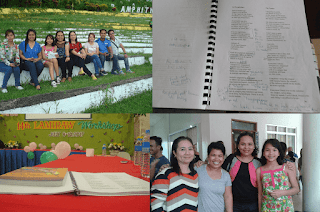 It was a great help – the "beating" that my poem and my essay received during the workshop was tolerable because I had them revised several times before submission. After editing my entries, I translated them into English. The translation is for the other participants and panelists who do not understand the Waray language. To make the long story short, I was able to beat the deadline. Then, I waited for the result of the screening. and listening to the panelists that I was not able to take pictures while the workskop was going on. There are three kinds of participants in a Lamiraw workshop: the panelists, the fellows, and the auditors. The panelists are experienced writers who assess each piece. They decide on the merit of each written work. They tell the fellows what is good writing or bad writing. (Panelists this year included: Dr. Maria Luisa Torres-Reyes, Dr. Hope Yu, Dr. Lydia de la Rosa, Prof. Yvonne Esperas, Comm. Jerry Gracio, Mr. Lucien Letaba, Ms. Firie Jill Ramos, and Prof. Harold Mercurio.) The fellows are writers whose works are chosen to be critiqued during the workshop. (There were 12 of us in our batch. We came from different backgrounds: some were teachers, others were fresh graduates, and some were students. Of the 12 fellows, 3 were males and 9 were females. As fellows, we did not pay any registration fee; food and accommodation were also free of charge. In addition, we were given a transportation allowance/subsidy.) Auditors are the participants who listen to and observe the discussions. They may also participate by sharing their insights about a written piece. Just like the others, auditors have workshop kits where they can read the fellows' entries. This year, auditors included alumni of the previous Lamiraw workshops. As fellows, we had to read all manuscripts: short stories, poems, and essays. The fellows were encouraged to give comments on each piece. After a work was discussed and evaluated, it was only at that point that the writer behind the piece was revealed. I felt mixed kinds of emotions during the workshop: my hands were cold, my face and my ears felt hot, and at one point I thought I was having diarrhea. This was what I was feeling when my entries were about to be critiqued. But, as soon as that phase was over, I was able to relax and breathe well knowing that another entry from a different fellow would be discussed. Despite the massive blackout in the region because of the two earthquakes that struck Leyte on the 6th and the 9th of July 2017, the workshop was successfully implemented. We had a wide and comfortable accommodation at Balay Padi in Mondragon where we had electricity from the generator until 12:00 midnight; we had abundant food from UEP Kapihan; and the UEP organizers headed by Dr. Leonila Longcop always had ready smiles for us even though our sessions lasted until eight o'clock in the evening (plus they were very helpful every time we needed their assistance). Most of all, each one of us – whether fellows or auditors – learned many things from the workshop. We can use them in our classes and as we continue to write in our own languages.